It has been another busy week, which has meant being inprisoned at home - apart from a couple of very brief journeys in the local area. One of those areas has been immediately outside my front door, and the tree next to the railway line footbridge on Frenches Road, where the Waxwings have been making sporadic visits of late. Their numbers have fluctuated during the past five days from more than 20 to around four of five. They have found another rotting apple tree, remarkably similar to the one further down the road, but in a back garden right next to the footbridge. This tree had, from the threadbare state of the crop of rotting fruit, been visited quite a few times, so it won't be long before the Waxwings really do move on. 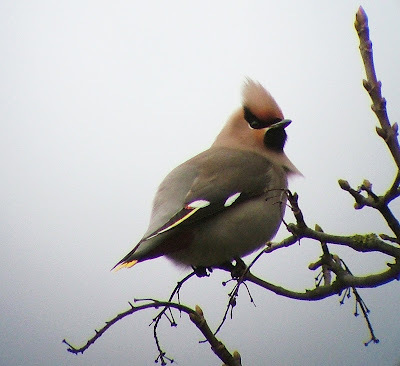 It is now about six weeks since these birds first arrived in the area. It has been the birding equivalent of a Pot Noodle. Just walk out of the front door and look up at the tree - as straightforward and convenient as a ready-made meal. Apart from that, the only other birds of interest I have seen this week have been two Kingfishers. I saw one flying up and down the brook by the Fordbridge at the Holmethorpe patch, and then another one skimming low over Bay Pond in Godstone late yesterday afternoon. I was able to get out at about 4pm, and shot over to Godstone to try to relocate the Bittern I had seen on Tuesday. I met up with David 'Devilbirder' Campbell and another chap from Smallfield - who had seen the bird early that morning. As the sun set and the light faded there was no sign of the Bittern. I had a feeling it would make an appearance at some point, as it had roosted up in a tree earlier in the week, and I expected it would do the same tonight. Sure enough, from behind the undergrowth opposite the footpath, the Bittern reappeared. 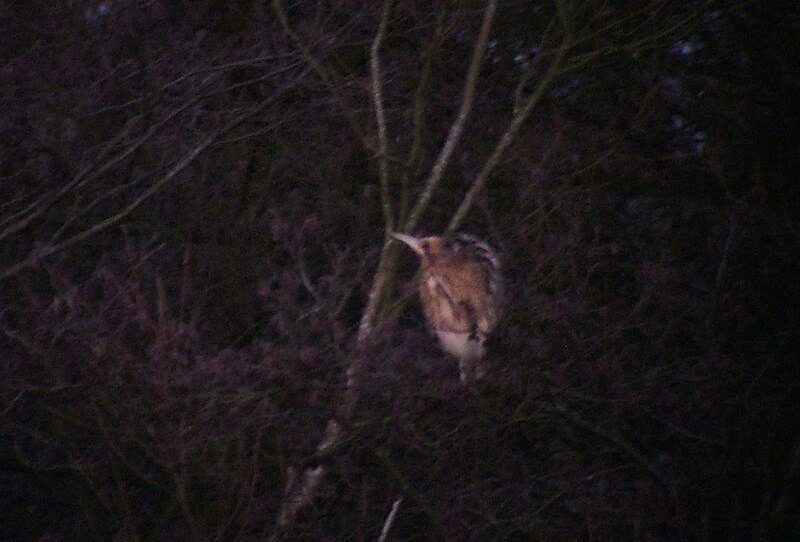 It stood for a short while before flying up into the branches for the night. We got some great views of it although, once again, the light was too low for any decent photos. 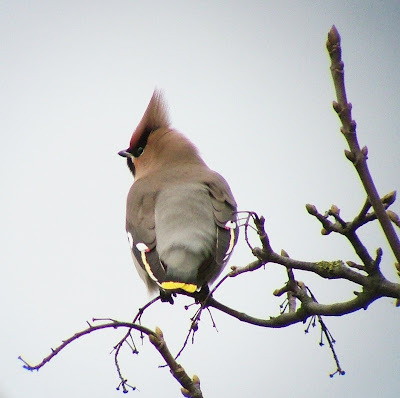 For those interested in seeing this excellent bird, the best times are probably at first light and at sunset. Having not really been out that much since the turn of the year, I have a bit of catching up to do as far as a Surrey year list is concerned (I'm only on 69). The only consolation is whatever I miss at this time of year I should have a half-decent chance of seeing from November onwards. It really isn't worth getting into a mad panic about it just yet - all those Gulls at Beddington, for example, can wait. As can the Thursley Common Great Grey Shrike, which is proving to be very elusive at the moment.